Every volunteer fire department has a long list of competing priorities. Amid the fast-paced daily business of managing your department, the absolute last thing you need is the nightmare of technical difficulties. Coordinating all your members’ mismatched calendars, checking the spelling on dozens of wildly different email addresses, and the agony of losing files due to a computer malfunction all take up an incredible amount of your valuable time. Google recognizes the value of the services that nonprofits provide to the community. In return, they’ve made their G Suite program free for not-for-profit institutions that meet minimum guidelines. As long as your nonprofit is in good standing and meets a few other requirements, you can access these services without affecting your budget. Let’s face it: the average volunteer firefighter has a lot going on. If they can’t read an email, open a meeting request, or view documents from their phone, they may not have another opportunity for hours – or days. Luckily for them, the G Suite program is both easy to use and mobile-friendly. When the resources are both familiar and at your members’ fingertips, your members are far more likely to use them. G Suite provides a company email account for every member of your department. This eliminates the need for the random grab-bag of personal emails from Yahoo, Gmail, AOL and other sources – and it keeps communication looking consistent and professional. We all know that one person who has an awkward or downright goofy personal email address, and chances are you don’t want that address to represent your department to the town board. Using G-Suite helps maintain a consistent, clean brand that shows you mean business. Take a look at your department’s list of events – your member meetings and town hall meetings, trainings and drills, auxiliaries, public education events with local schools, benevolent events, exempts, sports teams, and so much more. Now take a look at your member roster. How good is your team at keeping track of every single event, every time? Many members and a large schedule of events can lead to confusion, and that’s where the beauty of G-Suite can save the day. Before scheduling an event, you can check each member’s availability on their calendar, and you can track which members have confirmed they are going attend and which have declined (read more about the calendar features here). Maintaining your important files on a single computer is risky business. Malfunctions, accidental damage, and other unplanned problems are often devastating to locally saved files – especially if they happen right before an important meeting or other event. That’s why the “Drive” in G Suite is a lifesaver. If your computer goes down, your files are still available because Google Drive stores them online. The program is also compatible with mobile devices, so you can access, read, and edit all these files from your phone – as well as sharing editing or read-only permissions to your department members, so you can collaborate on the same document from miles away. Making the transition to G Suite is a big step, but the benefits are enormous – and for nonprofits like your fire department, the price is right! 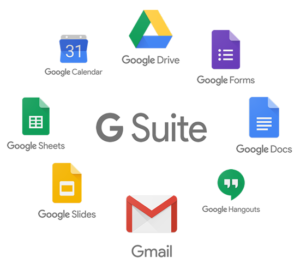 If you aren’t sure if G Suite will work for you, or if you are looking for a consultation to learn how you can get the most out of these tools, check out our G Suite Management Service and we’ll be happy to discuss it with you.